Hanadama Pearls are often referred to as the “Ferraris” of the pearl world because they are considered to be extremely fine gemstones. As a result, only those that have been certified by the PSL (Pearl Science Laboratory) in Japan can officially be recognized as being a Hanadama pearl. These particular pearls were given their name by Kokichi Mikimoto who is often referred to as the “Father Of Cultured Pearls”. It is the term used by him to describe what is considered to be the finest of all pearls you can now buy. When translated from Japanese into English the name Hanadama means “Spherical Flower”. This is why often you will see many pearl experts will also refer to any kind of Hanadama pearls as “Flower Pearls”. But What Is The Difference Between Hanadama Pearls And Other Pearls? Well, as already mentioned only pearls that have been given the right accreditation by the PSL can be classified as being a Hanadama pearl. In order for any pearl to be classified as this type, there are a number of rigorous tests that all pearls will undergo. The tests that take place look at the following aspects of each pearl. 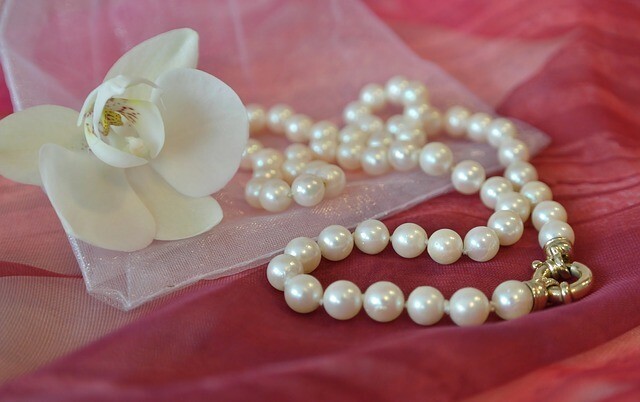 The main difference between say certified Hanadama Akoya pearls and others is that these particular ones have the highest luster of all cultured pearls now available. Their luster is such that their brightness will attract the attention of anyone who sees you wearing such beautiful gems. Any light reflected off their surface is very crisp and sharp, which helps to accentuate the beauty of these particular types of pearls even more. As these particular pearls have a much thicker nacre compared to say Akoya or Freshwater pearls they are much more resilient. You will often find that they actually last a great deal longer, especially if you take care of them properly once you have invested in such beautiful gemstones. Plus, as these pearls also come with a certificate from the Pearl Science Laboratory in Japan they do make the perfect item to pass down from one generation to the next. The truth be told, is that you should never think of the Hanadama certification as a particular pearl grade as would normally be given to pearls. Instead, you should think of them as a class of pearls completely on their own. When you own any piece of jewelry that contains any Hanadama pearls you are owning what are considered to be the best types of pearls that mother nature is able to produce. To further help you see why these pearls are considered to be among the best in the world today let us explain a little more about the grading system often used for pearls. The surface of these pearls is around 95% free of blemishes and has a very sharp mirror-like luster to their surface. Any light reflecting off the surface is very sharp and crisp. They have a perfectly round, round or nearly round shape. These pearls will have a surface of around 90% free of blemishes. Their luster will be medium to sharp and any light reflecting off them will be fairly crisp and sharp. They will have a perfectly round to slightly off-round shape. Around 80% of the surface of these pearls will be free from blemishes and come with a medium to low luster. Any light reflecting off them will be soft and have blurred edges. They will still come in perfectly round to potato and off round shapes. These are considered to be the least favoured as only 70% of their surface will be free of blemishes and their luster will be very low. Such pearls tend to have a very dull appearance to them and any light reflecting off them will be very soft and blurred. As for shape, some may be round to near round in shape, whilst others look more like a potato. But as already mentioned when it comes to Hanadama pearls they have very few if no flaws at all to them. They may cost more in comparison to other pearls but would look wonderful when worn with any kind of outfit, but are really best kept for those more special occasions. If you are thinking about buying a piece of jewelry that is made using these beautiful but classic types of pearls then there are certain things to consider before you do. We offer a few tips below that should help you to choose the right kind of Hanadama pearl jewelry to present to that special woman in your life. There are many different kinds of jewelry that you can now purchase that have these beautiful pearls included in their design. But before you decide what piece of jewelry to buy for that special woman in your life you need to consider what colour the pearls should be. Hanadama pearls tend to be white, but some will be more cream in colour and like other pearls will have various colour overtones to their surface. Although white pearls are ideal for all complexions, some women may find them a little too bright against their skin. For such women, you may want to consider opting for any piece of Hanadama pearl jewelry that is made up of more cream coloured pearls. Once you’ve decided on the colour of the pearls in the jewelry the next thing, of course, you need to decide on is what piece of jewelry you are going to buy the woman who you will be presenting such to as a gift. Below we take a look at the three main pieces of jewelry that you should consider buying for them. Earrings are perfect as they complement any face shape. Can be worn with casual outfits or with semi-formal and formal wear. If you want the person to be able to wear them whenever they like opting for a pair of Hanadama pearl earrings that contain 6.5-7mm Hanadama pearls in them. Any kind of pearl necklace should be a staple in any woman’s jewelry collection. The creamy colour of the pearls in such necklaces makes them ideal for wearing to formal evening events or just to the office. Does the woman you intend to present such a beautiful gift to love to be the center of attention? If she does, then, of course, choose a Hanadama pearl necklace that is comprised of 8.5-9mm Hanadama pearls in the piece. A pearl bracelet even one that is made up of these beautiful pearls is a very versatile piece of jewelry for any woman to own. Plus, this type of jewelry adds a touch of refinement to any outfit the woman may choose to wear it with. Not only does a Hanadama pearl bracelet look stunning on its own, but looks even more spectacular when worn with a matching pair of earrings of a beautiful necklace. Ideally, choose a bracelet containing Hanadama pearls that comes with a white or yellow gold clasp. The reason for this is that the colour of the metal used in the clasp helps to emphasize the glistening luster of these beautiful pearls even more. If you keep in mind the information that we’ve provided above then you are sure to find the perfect gift to present to that special woman in your life. If you are having any problems trying to decide just what piece of jewelry to get her that includes Hanadama pearls in the design you may want to consider asking friends or family if they can make any suggestions for you. Also, if you have the opportunity to take a look at her jewelry collection to see if you can get any ideas from the pieces of jewelry she likes to wear already. At PearlsOnly.com we have a wonderful collection of different pieces of jewelry made using beautiful Hanadama pearls. Anyone of these could make a wonderful gift for someone special in your life. What woman would be upset if you were to present her with a beautiful pair if Hanadama pearl earrings, or a Hanadama pearl necklace or bracelet?